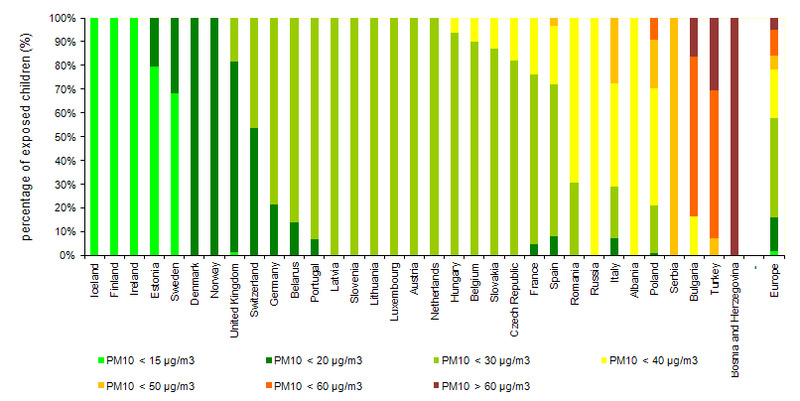 Slovenia belongs in the group of EU countries, which are more polluted due to particulate matter (PM10). The average annual concentration of PM10 is exceeding the limit value recommended by the World Health Organization (20 µg PM10/m3). Very young children, including unborn babies and elderlies, are particularly sensitive to air pollutants like PM. Analyses show that in Slovenia every two of five children is exposed to negative consequences of PM10 pollution. Most children living in European cities are exposed to PM10 levels that do not exceed 30 micro g/m3 but in Slovenia 15 % of children are exposed to concentrations of PM10 between 30–40 µg /m3. As a consequence, 15 % of hospitalization of children is due to respiratory diseases. This indicator shows the exposure of children (aged 1–14 years, inclusive) to polluted air due to particulate matter PM10 in Slovenia and selected European countries and the percentage of children in Slovenia who were admitted to hospitals due to diagnosed respiratory diseases. The diameter of particles is usually described with the phrase ‘aerodynamic diameter’. Particles of the same shape and size but that have differing densities have different aerodynamic diameters. Based on the diameter size, we distinguish between PM10 particles, (with an aerodynamic diameter below 10 µm), PM2.5 particles, (with an aerodynamic diameter below 2.5 µm) and PM1.0 particles, (with an aerodynamic diameter below 1.0 µm). The size of particles formed during interactions between gases and particles, in gaseous as well as in liquid form, is mostly below 1 µm. They are called fine particles. Coarse particles (with a diameter over 1 µm) are created by surface dispersion. Exposure to PM10 is shown in the indicator for various groups of PM10 concentration levels: 0–30 µg/m3, 30–40 µg/m3, 40–50 µg/m3 and <50 µg/m3. The percentage of children exposed to individual groups of PM10 concentration levels was calculated for Ljubljana, Maribor, Celje, Murska Sobota, Nova Gorica, Trbovlje and Zagorje ob Savi, where regular monitoring of particulate matter air pollution is provided. In calculating the percentage of children in individual groups of PM10 concentration levels, the total number of children living in a city/town is taken into account. The classification of a measurement site by PM10 total concentration level was carried out on the basis of measurement results reflecting the annual PM10 concentration level in outdoor air per individual measurement site. to adopt measures to combat climate change and its consequences. Concentration of PM10 is a good indicator of exposure to dust particles in the outdoor air. A number of epidemiological studies carried out in Europe and elsewhere in the world show a relationship between exposure to PM10 and the health of children as a particularly vulnerable social group (Cohen et al., 2004). Dust particles are present in all areas occupied by people. Humans generate dust particles with activities such as transport, energy generation, heating and industry. Dust particles smaller than 10 µm are particularly hazardous, as they can penetrate deep into the lungs (Brunekreeft, 2002). PM10 and high ozone concentration in the air are the most common air pollutants causing harmful effects. The mechanism that causes these effects can be attributed to oxidative stress. Oxidative stress means generation of reactive substances (radicals) that may damage genetic material. Reactive oxidative species produced in response to air pollutants may disturb processes within cells, which can lead to the destruction of cells or can affect genetic material within cells. Also, pollutants harmfully affect genetic material by changing the expression of genes without damaging DNA. These mechanisms are usually targeted in the treatment of allergies. Further studies are required in order to recognise at risk children and understand how the mechanisms regulate the connectedness between genetics and the environment (Kim BJ, Hong SJ, 2012). In addition to oxidative stress, particulate matter also causes chronic inflammation of the respiratory tract, which causes a pronounced immune response. In the respiratory tract, inflammatory cytokines are released locally (CRP, IL-6, TNF-α) (Patel M, 2013). It has also been proved that neutrophils, (immune response cells) activate reactive oxidative species that additionally exacerbate an inflammatory reaction, cause hyperreactivity of the respiratory tract and damage lungs (Auerbach A, 2012). Several types of pulmonary receptors are stimulated by PM particles. The afferent autonomic system thus becomes activated and causes the prevalence of the sympathetic over parasympathetic nervous system. The consequences are numerous (fluctuating blood pressure, faster heartbeat frequency, etc.) (Peters A, 2012). According to the data provided by the National Institute of Public Health of the Republic of Slovenia, children in Slovenia aged 0–15 years are exposed to PM10 concentrations of 30–40 µg/m3, on average, which is above the WHO recommendation (20 µg PM10/m3). In 2012, 87% of children in Slovenia were exposed to the recommended maximum annual PM10 concentration (0–30 µg/m3). The lowest concentrations (below 20 µg/m3, which is the maximum acceptable limit recommended by the WHO) were measured at the stations in Iskrba, Kovk, Dobovec and Zelena Trava. Thirteen per cent of children in Slovenia were exposed to an annual recommended concentration higher than 30 µg/m3 PM10 – this value was exceeded in Celje, Trbovlje and Zagorje. The highest annual value (45 µg/m3) was measured in Ljubljana, which was expected considering the dense traffic. In other parts of Slovenia, the annual value of PM10 in 2012 was between 20 and 30 µg/m3. The data on hospital admissions reveals that the number of children (aged 0–15 years) admitted to hospitals for respiratory diseases in the period 2002–2013 was the highest in Nova Gorica, Murska Sobota and Celje. The Slovenian Environment Agency, which carries out regular national monitoring of air pollution, estimates that the cause is a high percentage of wood burning stoves, which prevail where district heating is not provided. In 2013, the percentage of children admitted to hospitals for respiratory diseases slightly increased in Murska Sobota, as well as in Celje and Nova Gorica. These three cities are still leading in Slovenia in the number of hospital admissions for respiratory diseases. In the two-year period 2012–2013, the percentage of children admitted to hospitals for respiratory diseases increased in all cities where measurements are carried out. The number of hospital admissions for respiratory diseases of children aged between 0 and 15 years accounts for 15% of all hospital admissions of children in Slovenia. This number would be much higher if these children were not so well looked after by paediatricians. According to WHO calculations, the number of hospital admissions for respiratory diseases of children aged between 0 and 15 years would decrease by around 200 patients if the average annual PM10 concentration in Slovenia were 20 µg/m3 (or less). A reduction of the concentration of particulate matter (PM10) by 10 µg/m3 would reduce the time children aged between 5 and 14 years suffer from diseases of the lower respiratory tract (wheezing, chest pain, shortness of breath, cough) by 1.9 days/year/child. It has also been foreseen that the use of bronchodilators would decrease by 18% per year in children with asthma aged between 5 and 14 years. The introduction of new and effective therapies has contributed considerably to a reduction of hospital admissions of patients with severe asthma. Based on methodology developed under the auspices of the WHO (APHECOM, 2010), it was established that 20 adults died in Ljubljana in 2006 due to air pollution with PM10 particles. These were premature deaths resulting from exacerbation of existing diseases. In the same year, 40 people were admitted to hospitals for exacerbation of cardiovascular diseases and 20 were admitted for exacerbation of respiratory diseases. In all admissions, the cause was exacerbation of existing diseases due to exposure to current levels of pollution containing PM10 particles. If the average annual PM10 concentration in Slovenia were below 20 µg/m3, the above-mentioned hospital admissions or deaths would not have occurred (APHECOM, 2010). Exposure to PM10 causes exacerbation of bronchitis in children. In Slovenia, approximately 23% of children (aged 0–17 years) are admitted to hospitals annually for chronic bronchitis (Asher MI et al., 2006). Some studies also indicate that occurrence of atherosclerosis and deterioration of lung function in adolescents are a consequence of exposure to particulate matter (Brook RD et al., 2004). According to European Environment Agency (EEA) data, 18–41% of the EU population in the period 2001–2010 were exposed to PM10 concentrations above the EU target value for human health protection. The WHO warns that in Europe, the majority (82.8%) of the population is exposed to levels of particulate matter above the WHO recommended values (20 µg/m3), while 23.3% of the population is exposed to concentrations above the EU recommended values for environmental protection (40 µg/m3) (ENHIS, 2011). Based on the collected data, the WHO concluded that in 2009, populations of some countries in eastern and southeastern Europe were exposed to elevated concentrations of PM10. The number of exposed children depends on geographic location and measures taken by individual countries or cities to reduce air pollution. 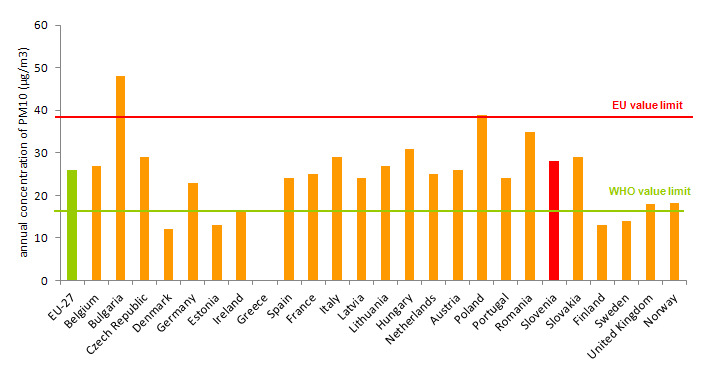 This is evident from the comparison of mean annual values of PM10 concentration between the EU-27 countries. In Slovenia, the mean annual value of PM10 concentration is above the EU-27 average (2009 data) as well as being above the limit value recommended by the WHO (ENHIS, 2011). Long-term exposure to PM10 increases the risk of pulmonary and cardiovascular diseases and the risk of death resulting therefrom. The effects of exposure are a result of PM10 concentration and the duration of exposure. Elevated concentrations may lead to insufficient development of lungs, asthma exacerbation and respiratory disorders. The risk of mortality begins at a young age; long-term exposure to dust particles increases by 0.5% for each increase in the mean annual concentration of particles by 10 µg/m3. In setting a safe and acceptable risk limit in respect of particles smaller than 2.5 µm, the authors believe that the mean annual concentration should not exceed 13 µg/m3. The risk increases above this value. In order to decrease health risks, we therefore propose that a mean annual value of 10 µg/m3 for PM2.5 and 20 µg/m3 for PM10 be ensured (Hong et al., 2002).